The end of the school year is nigh and that means that the eighth grade students are leaving us. If you don’t have children and are not involved in education, making it to the end of the eighth grade is the biggest most important thing that has ever happened to anyone. There’s a class trip, an awards ceremony, a farewell dance, a graduation, a yearbook signing day, and all kinds of parties. To me, it seems a little much, but hey, let the kids enjoy their youth before they get to the day when they realize that life is a series of disappointments punctuated by the releases of movies you kind of want to see. Last week was the class trip to Universal Studios and Universal’s Islands of Adventure. It was a chance to spend time with my students outside of a classroom and have a little fun. They are a good class and some of the kids are even turning into real people who have interests other than gossip and backstabbing. Overall the day was a blast. The last time I went wizarding, I brought home a couple of interesting non-chocolate snacks, so this time around I hoped to grab a few products that were a touch more cocoa influenced (and I don’t just mean a Lee Jordan poster). If you are unaware, in Florida summer starts in March and ends when you’re dead. Since we went to the Wizarding World of Harry Potter first thing in the morning, I knew I was rolling the dice on whether or not the chocolate items would make it back to the bus at the end of the day. I bought two treats from Honeyduke’s: a bag of Fizzing Whizzbees and a box of Peppermint Toads. Sadly, the Fizzing Whizzbees are now an amorphous ten dollar mound of melted disappointment. But the Peppermint Toads made it through, more or less, in good shape. They did unite into a hiveminded overfrog, but after a little cryo-therapy in the fridge, I was able to extricate a few from the center of the block. I’m sure these were a no-brainer when picking which foods from the books would be the easiest to translate to real life products. 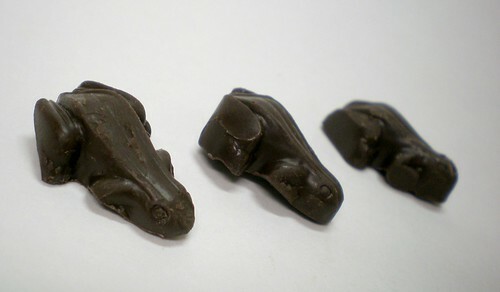 Peppermint-flavored dark chocolate in the shape of little toads? Charge ten bucks for four ounces and away we go. Peppermint Toads taste like Girl Scout Thin Mints. Which is to say, not great but not bad. 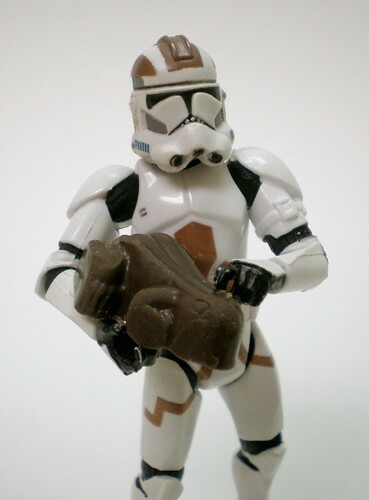 The chocolate is mediocre. There’s a lot of palm kernel at work here, so the toads have that weird overly smooth texture that weirds me out a little. The chocolate could easily be improved, especially for the price, but when you’re goal is to sell a box of cheap-to-produce somethings that someone can take back to Grandma in Missouri, I guess we can’t expect too much. I’m just thankful that cocoa is actually in the ingredients list. If you’re in Orlando and haven’t asphyxiated on Eastern European BO, pick up a box. 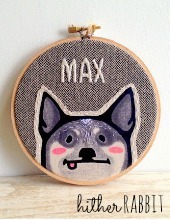 They’re cutesy and would make a decent gift. You could do worse. I mean come on, Grandma doesn’t really need an Elder Wand does she? Just break off a branch from the plant in the hotel lobby. She’ll never know the difference. 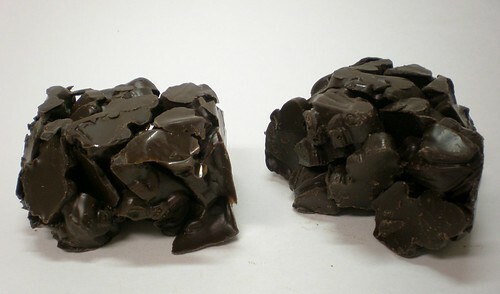 Next time you have $10 to spend on chocolate, go for the Vosges Habana bar – salted plantain chips in deep milk chocolate. Though, it’s not toad shaped. sad. Hope you enjoyed the Wizarding World! 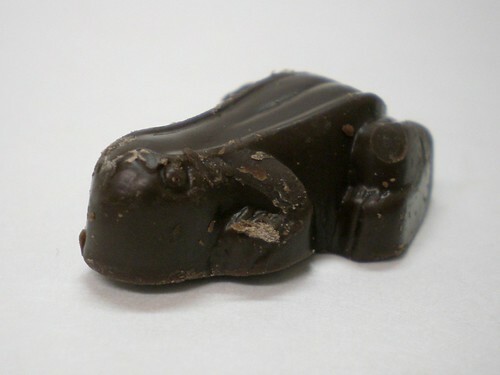 When I was over in the US i went and bought a big chocolate frog, wasnt really the most pleasantest of chocolates but the novel factor was great. I forgot to grab a frog on the way out! I’m so jealous of the fact that you’ve been to the Wizarding World of Harry Potter. I’m not so jealous of the things you’ve eaten there. Do they sell any sausages or butterbeer in there? If so, have you tried any? They’ve got butterbeer and frozen butterbeer. I’ve only had the regular. It tastes like really sweet cream soda. Very foamy. No sausages that I know of. But the fish and chips were surprisingly good. Pumpkin juice is pretty tasty as well. This review made me spit out my tepid coffee. Hilarious! I feel a bitterness kinship with you. Awesome photos to accompany your reviews! Hello. 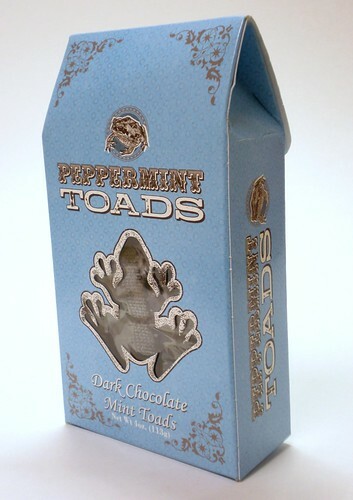 I noticed your blog title, “Wizarding World of Harry Potter Peppermint Toads: A Review | Food Junk” does not really reflect the content of your web-site. to write it for Search engine marketing or for your visitors? time I want the best quality for my website visitors. end? I’ll cheeck back later on and see if the problem still exists.